Spring may be on its way, but winter still has us in its chilly and sometimes depressing grasp. Luckily though, the intarsia knits dominating this season are a sartorial remedy for both ailments. Not only do they add coziness, colour, and cheer to a drab winter wardrobe, their graphic elements are a refreshing alternative to solid-coloured knits. 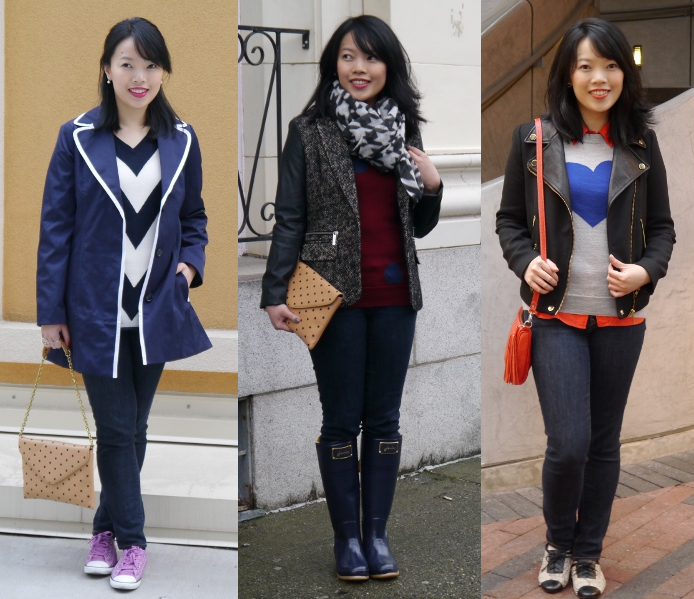 I've turned to intarsia sweaters time and again this season when I wanted a bit more visual interest in my casual outfits. Intarsia sweaters are also ideal transition pieces for early spring since their sense of whimsy transcends seasons; layer them under light jackets and over silk blouses. And with so many appealing motifs like hearts, anchors, polka dots, and obscure animals to choose from, it can be hard to stop at just one. Which explains why even though I have several already, I'm eyeing the J.W. Anderson x Topshop dodo sweater set to hit stores in March. Are you a fan of intarsia knits? Which ones do you have in your wardrobe? cute outfit, I'm big on sweaters right now. and did you watch walking dead on sunday? pretty awesome epsoide! We're not going to see season 3 until it hits Netflix, sadly. Yeah, it's a little out of my budget too. J. Crew is great for intarsia sweaters that don't cost an arm and a leg. 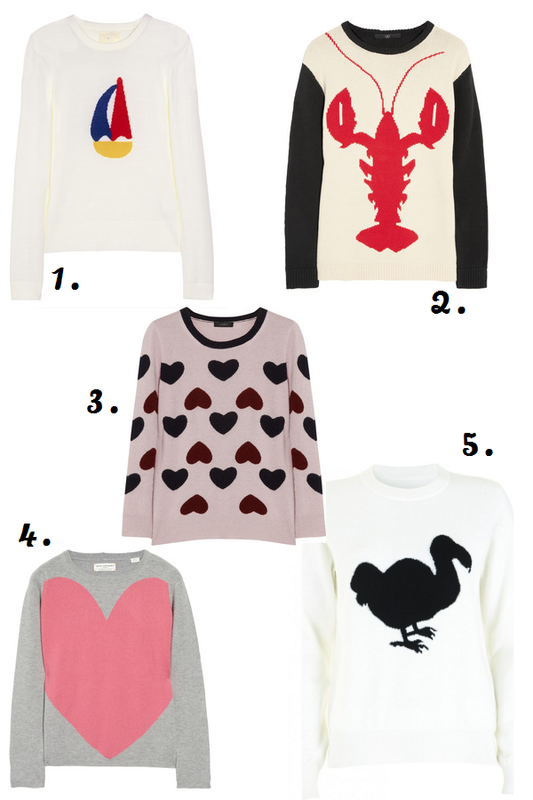 These sweaters are so cute - I'm obsessing over the lobster pull-over! I've never heard of Intarsia, but I'm off to check them out right now. Thanks for sharing, Lisa! Intarsia is the knitting technique used to combine the yarn colours used in the patterns.